Combining intellectual history, social science, economics, and pop culture, best-selling author of Liberal Fascism, National Review senior editor, and syndicated columnist Jonah Goldberg makes the timely case that America – and other democracies – must actively defend liberty against forces pulling us back to the tribal and nationalistic ideologies of the past. 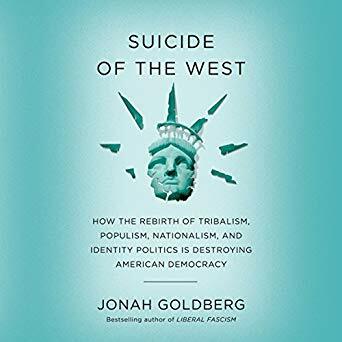 Goldberg exposes the West’s suicidal tendencies on the left but also on the right – at a moment when many conservatives are surrendering to tribalism and nationalism. Suicide of the West asserts that for the West to survive, a renewed commitment to classically liberal principles is required. Suicide is painless; liberty takes work.